It’s becoming increasingly common to read and hear about sharing economy apps with a business model based on the collaborative economy concept, which basically consists in a system with no middlemen. By using this business model, users can get in touch with each other directly and take on the roles of supply and demand. Hence, users are able to come to agreements of all kinds based on their characteristics and capabilities in a way that they all end up profiting. There are thousands of digital platforms for exchanging products and services that are expanding at full speed. In Spain alone, there are over 400 mobile applications focusing on different areas and categories. More than 50% of Spaniards say they are willing to share or rent their belongings in exchange for money within a context of collaborative consumption. What are sharing economy apps? The success of these sharing economy apps based on the collaborative economy model poses a challenge to traditional companies. In Europe, mobile applications like Airbnb or Uber are worth more than USD 30 billion on the stock exchange market. The sense of ownership or desire for possession is another aspect that is also changing. Acquiring, buying, having, owning were the verbs that better conveyed the essential ambition of a bygone era — an era in which a human being was defined by what he owned. Portraying some success stories is the best way to demonstrate what a collaborative application is all about. You definitely already know many of them. You may even have them on your smartphone! This is one of the most evident examples and we’re sure that you know how it works. Amovens masters the use of collaborative economy applied to car transport. They face competitors in each of the services they offer, but in their own words: “we are the only ones integrating them all into one solution, which translates into greater flexibility and a better price — all managed from your mobile device.” It’s like if Blablacar and Pepecar have been blended into one app. On the one hand, its operation is very simple: you just say where you are and where you want to go and then determine your schedule. The application will then display the drivers who have published your route so that you can choose the one suiting your needs best. On the other hand, it allows you to get the most out of a car “either by reserving a seat on a trip or by renting the most suitable car for a weekend out”, they add. Personally, I find it a cheap way set up a vacation or a trip. The app has only been on the market for a year but the company has managed to improve the management of accounts and overall experience on mobile devices, nevertheless. The brand also points out its sustainable and energy-efficiency aspect. The app’s new version will be launched later on during this month of October and promises to provide greater ease and convenience when managing mobility — whether it’s for sharing a car or renting it. Despite being a newcomer, this is one of the most emblematic mobile applications of the current corporate economy. 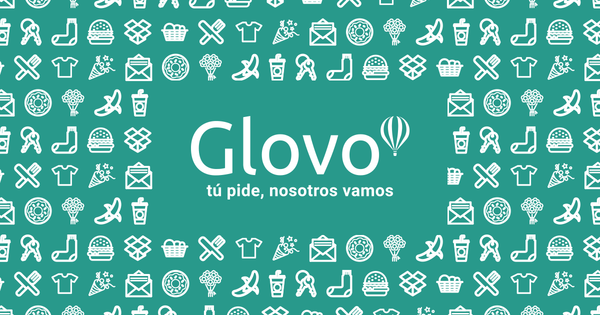 Glovo‘s objective is to take on the role of the classic delivery boy — but in the digital world. It’s a long-distance courier service. It works in a very simple way: they will deliver any products that you need or request. These products may range from a simple coffee to pharmaceutical products or clothes. You only have to order what you want through the application. The payment is done directly on the app. Once you have placed a request, the Glovers in your city will tend to it via their mobile application. To register as a Glover you only need to have your own vehicle, a smartphone running on Android or on iOS and be over 18 years old. The upside to it? If you need something urgently, they commit to bringing it within an hour. The downside to it? The service can be a tad expensive, especially if you are not really in need of what you requested. However, you can always give it a try as the first delivery is free. This is an application based on the collaborative economy and aimed at foodies. It allows users to sell their homemade food to other users who are willing to try such delicacies. Users simply have to choose what kind of food they want to buy and Chefly will find nearby cooks matching their preferences. Despite being a very new platform and currently limited mainly to Madrid, it has good odds to become the next trend among office workers. It’s needless to say that users who buy food can evaluate and comment on the food they have bought. Yum yum! Let’s get our taste buds going! This is undoubtedly one of the most important applications nowadays. It allows people to offer spaces to rent. These spaces can be rooms, shared flats, whole houses, etc. Airbnb is increasingly being used by all kinds of travelers. It’s a great resource for them, given the app’s great flexibility in terms of what it offers. It has been on the market for some years already and is thriving wonderfully; many members of Yeeply’s team have tried it when traveling. Shall we go on a trip? And finally, there’s this app offering an answer to all those who have too much stuff but no space to store it. If you are a little like me, surely you have things that you don’t use anymore but will not throw away even if you have no idea on where to store them. Letmespace will help you find storerooms and garages in your city to store your things. The app even insures your belongings, which is great to know if you are a bit afraid of leaving your valuables in someone else’s storage room. The idea is very well thought out and the app is available for Android and iOS devices alike. Our world is undoubtedly changing due to collaborative economy applications and the benefits this concept offers users and consumers around the world. Generally speaking, it promotes a form of responsible consumption, which is more environmentally friendly while avoiding unnecessary high-street spending. And the best part is that these apps achieve all this in a simple and ‘clean’ way with the help of new technologies. Many of them have both a website and an app. Have you ever used an app of this kind?